Experience is a great teacher. And experiences with money can provide some of the most important lessons of all. Have you ever said to yourself, “Man, I wish I had done this or that” or, “I wish I hadn’t done this or that,” you’re not alone. It is very important that you take a moment to consider what is at the core of your relationship with money. I have. Learning about money can be life-changing and I have learned some amazing truths about money. Here are five important lessons about money. Humans over time have made gradual steps toward the future with innovation and usage of tools. From tools used for hunting and gathering to those used for farming and trading. Money, as we understand it today is the world’s most ubiquitous tool. It is used for everything. Let’s be very clear about how value is ascribed to money. Printed money or fiat money, has no inherent value, it assumes value because it is a legal medium of exchange. Real money is backed by something of value, generally a precious metal such as gold. There should be a difference between how we value currency versus how we value what the currency represents. One of the keys to understanding money as a tool is to first understand what real money is. Once you’ve done that, take the time to strategically think through how best you can utilize this tool. In general, being employed is the primary way in which people earn wages (money) they exchange labor and time for wages. Wages/earnings equate to money. Money can also be grown or invested. 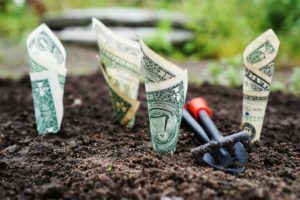 Money in many ways can be represented as a seed (capital) where it can be planted or invested by an (investor) for the specific purpose of getting a return a return (creating a profit). There are numerous ways to grow and invest money. Seek out which is the best option for you. Publications such as Forbes and Money are great resources to get more information on investing. Much like a craftsman perfecting his craft, it takes time to get better at managing money. To become more proficient requires time, work and dedication. There are some basic principles that can help you become more skilled in managing your money. For instance, learning how to budget and can help you develop positive habits that will serve you well over time. As your knowledge about managing money improves, it becomes easier to understand the more advanced concepts such as investing or planning for retirement. It all begins with having a basic understanding of managing your money. Money Lesson 4- Money follows purpose. One of the more important financial concepts I’ve learned is that, “money follows purpose.” Because money is a tool and has no will of its own, it can only do what it is “purposed” to do period. Let that sink in for a minute. One reason money often leaves your pocket or bank account and goes to a retail store is because those businesses have a clearly defined purpose for your money. A business owner creates a purpose for your money by creating a product or service. In fact, that whole process has a very critical role to play in our economy. The real issue here is that you must be disciplined about creating a clear purpose for your money. It goes without saying that if you don’t someone else will. We’ve often heard it said that, “people don’t change overnight.” There’s some truth to that statement. Winning the lottery won’t make anyone change who they’ve always been. They may change zip codes, but core values and beliefs are difficult to divest. Money can create for us – “a blow horn effect.” A blow horn is a device often used to amplify human speech. For example, if you’ve been a compassionate person, chances are you’ll still be compassionate with more money. Likewise, if you’ve always been irresponsible with money, then more of the same can be expected. One way to handle this potential imbalance, is to focus on becoming better at managing your money. Understand that this tool will only amplify who you are. Money Lesson 6– Money is literally everywhere. For many of the world’s citizens the thought, pursuit and business of money is all consuming. As a financial services professional, I often view the world through a financial lens. As a result, I understand that everything has financial worth…everything. Even things that we often take for granted such as trees and basic vegetation. For every segment of human life, apart from a few indigenous tribes, “money matters.” Many of the world’s conflicts and crises in some way stem from an economic origin. Much like ancient times money as a medium of exchange is evolving. Paper money may not be entirely obsolete but it’s very likely the future of money will be different. In fact, it may already be here. Cryptocurrencies such as bitcoin are challenging the traditional notion of money and is already occupying a unique space in our world, thanks to new technology. The key lesson here is we live in a world where virtually everything on planet earth can be quantified, everything has a value and because everything has a value, although not always easily converted, it can in some way be equated to money.